If you find you use your iPhone 7 enough during the day to deplete the battery, you might be interested in a new iPhone 7 battery case which is being created for both the iPhone 7 and larger Plus smartphones recently launched by Apple. 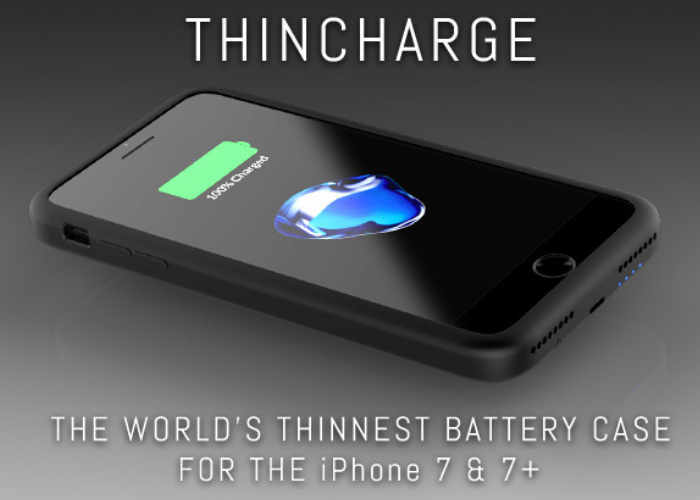 The developers of the ThinCharge say their iPhone 7 battery case is currently the thinnest on the market and is capable of helping you keep your smartphone topped up whilst away from the grid. The creators of ThinCharge explain a little more about the included technology and design of the iPhone battery case. We designed ThinCharge to be the absolute thinnest iPhone battery case on the market. No one likes a bulky case, so we made sure it never feels that way. We increased the battery capacity of our last ThinCharge from 2600mAh to 2900mAh for our iPhone 7 version! The 7+ version has a massive 3600mAh battery capacity without adding bulk. With ThinCharge, you can keep your phone running all day. ThinCharge is the World’s Thinnest Battery Charging Case for your iPhone 7 and 7 Plus. So thin, you won’t even know it’s there. For the first time ever, you can have protection and power in an ultra slim form factor. It’s half the size of other battery cases, and looks like just like a regular protective case. As featured on UnboxTherapy and PC Advisor, we’ve completely redesigned our best selling original to be simpler, more durable and more powerful. For more information on the new ThinCharge iPhone 7 battery case jump over to the Indiegogo website for details by following the link below.